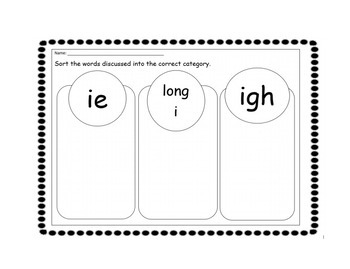 The active inspire introduces a digraph and trigraph for long i. (ie, igh, i_e) During the active inspire you can move the red oval to reveal the answer to the questions. Also when you click on the alphablocks image you will be taken to the you tube video to introduce the letter combinations. The last screen (the image shown), will be a handout for the students to work on with partners. Once students have came up with words, we discuss as a group and write on the board. This really reinforces the phonetic combination that is being taught.